VERY Happy to feature Danielle again from Etsy’s My Little Apricot! Just wrote a whole wonderful post about her in April so please go back to HERE and read it! LOTS of great info that I’m not going to retype so go read read read! 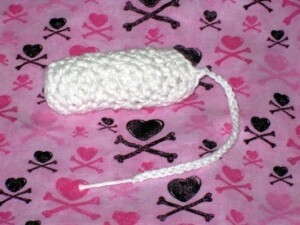 These crocheted tampons are handmade by Danielle’s own pattern that she has perfected. They are made with organic yarn that was grown, spun & dyed according to the Global Organic Textile Standard. Chemical free! Can’t say that about disposables can we? We had a couple winners back in April who have tried out this unique invention. Here is what they had to say! The regular and mini that she sent, I love! I am surprised by the amount they hold! I love the tampons, but could not use them. But being a resourceful gal, I use them as scrubbies every night to wash my face. They are a lovely product that has held up well. Danielle actually sells cute face scrubbies in her shop too! option for using when out & about… that’s my only complaint with the Diva Cup is if I happen to be in a public place & need a change it can be a little tricky (if not impossible). The LA tampons I could just switch out and put the used one in a wet bag in my purse – more discreet & less messy. With three sizes – mini, regular, and heavy, you can find the perfect fit for you or use all three during different days of your cycle. My Little Apricot has trial packs of two in her shop for you to try! Use Code CRUNCHYBCHMAMA for 20% off anything in her store! Thanks Danielle!! If you are a tampon girl then I think you will really like these! WIN 2 organic minis, 2 organic heavy and 3 organic regular! i think this could be a great idea.. it is new to me!! I follow apricot on facebook. I Like My Little Apricot on Facebook. I've made some of these from some organic cotton, too. They work great. I would, however, enjoy some I did not have to make. Always fun to have someone else do it for you! I get Crunchy Mail. Thanks. I've been a Beach Bum for over a year now. Thanks. What a great idea..one of those 'why-didn't-i-ever-think-of-that' ideas! I'm a FB Beach Bum! I get Crunchy Mail in my inbox! I'm not a tampon-user, but this looks like a great alternative to soaked mama cloth! I never really thought about it before, but why couldn't you wash and reuse tampons? I like My Little Apricot on FB. This looks like a fabulous alternative to disposable tampons! I would love to try them! These were the first organic fem. product I'd heard of. (From Life Your Way). Then I saw the pads . While trying to find a pattern so I could make my own, I read about the cups. 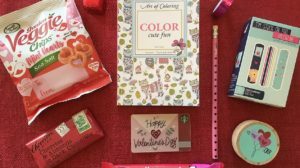 Though I never did by the patterns or the cup, I'd sure like to try any of these products. I'm not in need of them as often anymore though! Fan of little apricot on FB! I had not heard of crochet tampons before, so I really want to try these and see how they work! This is a very interesting idea. I have to enter just to have a chance to try these out. I like My Little Apricot on Facebook! I like Crunchy Beach Mama on Facebook! I subscribe to Cruncy Beach Mama by email! This sound interesting. I'd love to give it a try and see if I could save some of my money to buy something I won't just be throwing in the trash! 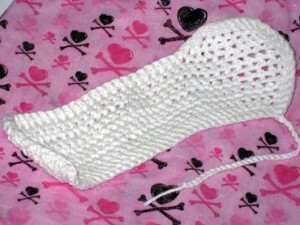 My thoughts: I am intrigued - I had never heard of crocheted tampons! I am always in search of a better tampon and would love to try these. I like My Little Apricot on Facebook as Zootastic Zookeeper. I think about that food I put in my body...but not about this item. Wow. I am really, really tempted to buy some but I have a ton of regular tampons I don't want to throw out. I have never seen or heard of handmade organic tampons. These would be amazing to use I am sure. My thoughts... I am so used to using tampons with an applicator, so I wonder if this would work for me? I hope so! I like My Little Apricot on FB under Kathryn Camille Stevens! I am a Beach Bum- on GFC and FB (Kathryn Camille Stevens)! I haven't had good luck with cups, and didn't know there were any cloth tampons out there. How great! I would really like to try crotcheted tampons! I like My Little Apricot on FB! I'm a bit skeeved out, but I'd give them a go! Great idea! I love that they are organic! I like MLA on facebook! I so want to try these- what a great idea! I had never heard of these before. Interesting. I've never heard of this, but I'd love to try them! I like Crunchy Beach Mama on FB! I want to try these. I love mama cloth. aabb. I am a beach bum.